Windham Fabric's Nancy Gere is proud to honor the Civil War sesquicentennial with Gettysburg – Civil War VIII. We traveled to Gettysburg PA, and had the rare privilege to visit the archives of The Gettysburg Museum which house some of our nation's greatest treasures. The archives in this facility truly blew us away. We saw rows and rows of immaculately preserved, and carefully cataloged Civil War objects. Everything from canon balls to uniforms were there for us to marvel at. We could have spent days looking, and nearly did! 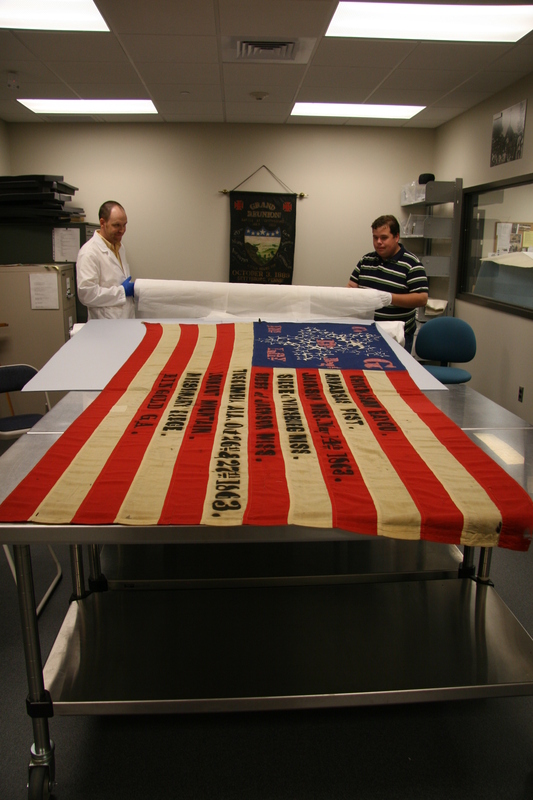 Some of the most fascinating textile objects were the collection of battle flags and commemorative flags. We know the museum's curator was happy to help us, as we "forced" him to unfurl flags that have been packed away, and not seen for years. 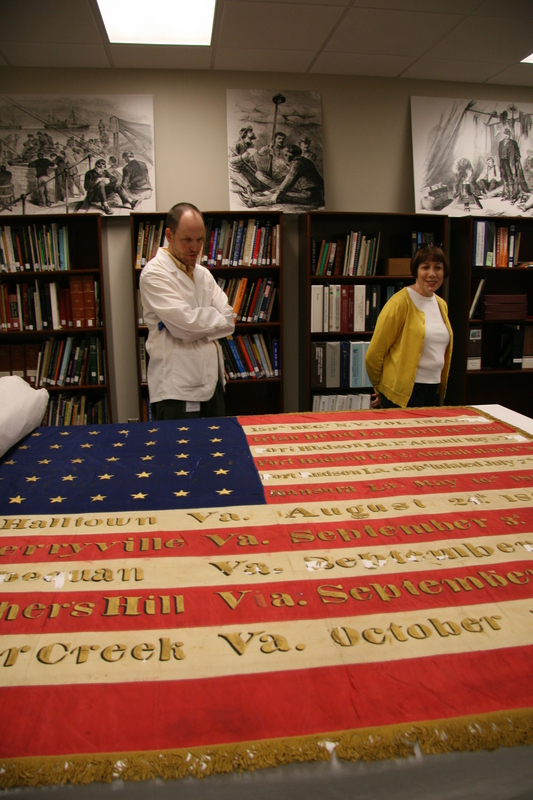 Laura enjoyed examining this beautiful commemorative flag. When we look at items such as this not only do we revel in their beauty, but we study them as to how they will fit within the collections. Some objects are more difficult to fit in then others, but as you will see, these stunning flags were no problem. Flags along with a scenic toile based on a commemorative Civil War scarf and countless delicate period florals, stripes, shirtings and geometrics make up one of Nancy's most memorable Civil War collections to date. We know that you will be equally impressed with the collections at The Gettysburg National Military Park and Museum. You will not only marvel at what you see, but gain insight by talking with the park rangers, and museum staff. These men and women are easily some of the greatest civil war scholars we have ever met. So celebrate with Nancy Gere, and Gettysburg, the 150th anniversary of this crucial moment in American History. Gettysburg – Civil War VIII will be available in quilt shops starting June 2010.